Forgiveness has fallen on hard times. And like all of virtue’s children, forgiveness is something we are much more apt to expect than extend. But the problem with forgiveness is we may not even understand its nature, its essence. And our varied misunderstandings have turned this foundational societal ingredient into something almost unrecognizable as the real thing. That any ordered and healthy society requires forgiveness in large doses is evident, as the growing lack of forgiveness demonstrates in headline after headline in our nation’s newspapers. It is apparent people are different, have different views, and will act out their differences in ways that create conflict. It is also apparent we all make mistakes, act in anger, say things that hurt others deeply, and just generally annoy one another in myriad ways everyday. Add in the stresses we all carry, and the fact things like alcohol and drugs diminish our capacity for self-control, and what you have is what we have: a society that will explode unless somewhere, somehow, we re-learn what our parents taught us about forgiveness. Perhaps it would be best to reconsider just what forgiveness is, and why it is so often misunderstood. Forgiveness is essentially refusing to be negatively motivated in my relationships and actions, by something that has happened. Someone smarter than me once put it this way: “Forgiveness is refusing to bring up the incident to myself, to others or to God.” That’s a tall order for sure, and yet we make the whole thing even harder by adding something to forgiveness that is actually not part of the package. The problem we all have with forgiveness is we assume – wrongly! – that forgiveness and reconciliation are really the same thing, and cannot be separated. In my work with couples where infidelity is a reality, I often encounter resistance to forgive simply because the offended party believes forgiveness means the relationship now has to be back to “normal”, and the offending party “got away with it.” The problem here is both forgiveness and reconciliation have been grossly misunderstood. Forgiveness actually deals with me primarily, not those who have wronged me. Forgiveness is the decision to no longer allow the wrongs I have suffered to rent space in my life and ruin any more of it. It is a passion to rid my life of the toxic poisons of bitterness, anger, and the harmful desire for revenge. As we all come to understand at some point in our lives, these poisons actually erode their container. To remain unforgiving, which we think of as a right we should enjoy, is actually to inflict deepening pain and erosion of spirit on ourselves. To forgive is better by far. Reconciliation is the result when forgiveness on my side engages with sincere repentance on the part of those who have wronged me. It takes both halves. In healthy people, forgiveness happens early, and yet reconciliation may not occur for some time, as those in the wrong work through their issues, and finally are brought to the point of sorrow and repentance. That means I may be wronged, and for my sake choose to be forgiving, while reconciliation and the re-establishment of full relationship may not happen for a while. And in some cases, it never happens. I can forgive, but reconciliation will not occur until there is sincere repentance. And the more times repentance is found to be fake, the harder eventual reconciliation will be. Of course, we’re talking here about big things that fracture relationships. Small things are best just flushed. Small things just need to be surrounded with grace and pushed aside. The stronger the relationship, the bigger the small things can be. And yet, in all relationships there are times when the wrongs are so big the relationship breaks in ways that are complex and deep. And it is here we must take the initiative. If we have been offended, we must begin immediately to forgive. If we are the offending party, we must begin immediately to do a radical examination of what our actions say about us, and what effects they have had on those around us. And when the sincere repentance of the offender meets the ready forgiveness of the offended, reconciliation can begin. In my life, the greatest time of reconciliation was also the time of greatest forgiveness. During my final high school years, I came to recognize I had been living a life of open rebellion against God, and had wronged the very One who created me. And when I came to Him in sincere sorrow for my willful, independent, self-centered living, I ran full force into the amazing comfort of His forgiveness. He’d been waiting for me all the time. He stands as the great model of forgiveness, and that forgiveness is available to all who come in authentic repentance and faith in the promises He has made to us in Jesus. David Hegg is senior pastor of Grace Baptist Church and a Santa Clarita resident. 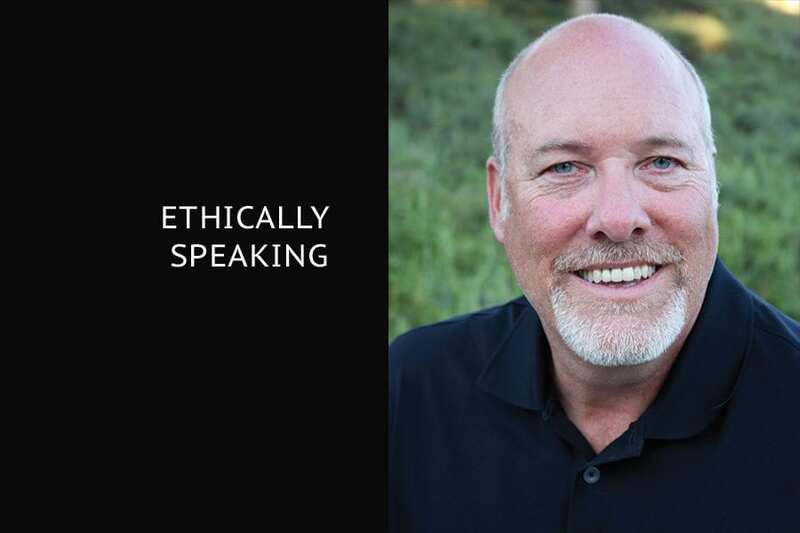 “Ethically Speaking” runs Saturdays in The Signal.